Christmas Comes Early in Inglewood! 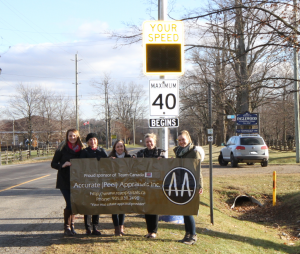 – Accurate (Peel) Appraisals Inc.
Santa`s busy & determined little elves at Accurate Appraisals & Heritage Caledon Realty finally carried the day with delivering the long promised solar powered speed limit sign to the north end of Inglewood. This will greatly enhance the safety factor of traversing the Credit Valley Trail & the Trans Canada Great Trail. This will inevitably be a real boon to local property values by enhancing the quality & peripheral aesthetics of the community. None of this would have been possible without the ardent support of; Sylvia Jones M.P.P, Barb Shaughnessy (Regional Councilor), Doug Beffort (Local Councilor), Jason Caruana(Homeowner) and most importantly Eric Chan & Steve Mathew from the Caledon traffic office. A thousand thank-you`s ! Lives will be spared !